“Hours of inking fun comes in this big tub of gel pens." Did you forget to buy a birthday card? No problem. Kids have a school poster project due? That’s covered too. A lot of projects start with excellent quality paper — so stocking your craft closet with some professional grade cardstock is one of the best options for casual and serious crafters alike. Neenah cardstock is easy to fold and score for that perfect quick, handmade birthday card. If you’re a scrapbooker, this paper will keep your memories safe from deterioration as it is acid- and lignin-free. This medium weight paper is ideal for painting, scrapbooking, cardmaking, die cutting, ink and laserjet printing and so much more. This Starter Kit has 18 assorted colors and a total of 72 12” x 12” sheets. Want to step your crafting up? Way up? Well, then adding a Cricut Explore Air 2 Machine to your crafting repertoire is a must. This digital bad boy will cut any letters, detailed designs, shapes, phrases — and just about anything else you can throw at it — with laser precision. The Explore Air 2 can cut over 100 different types of materials, like vinyl, cardstock, leather, iron-ons, glitter paper and so much more. Bluetooth technology allows you to create from virtually anywhere using the iOS app. And easy-to-use software lets crafters design, customize, preview and create from any laptop or smart device. With the Cricut Explore Air 2, you can cut, draw and score on pretty much anything. The Cricut Pens feature makes “handwritten” cards and projects with over 370 fonts. The scoring stylus will create perfect folds for envelopes, card, boxes, pinwheels and more. For the serious crafter, as well as those who just love putting a personal touch on things, professional-looking projects are just a click and cut away. Yes! You need a nice set of colored pencils. 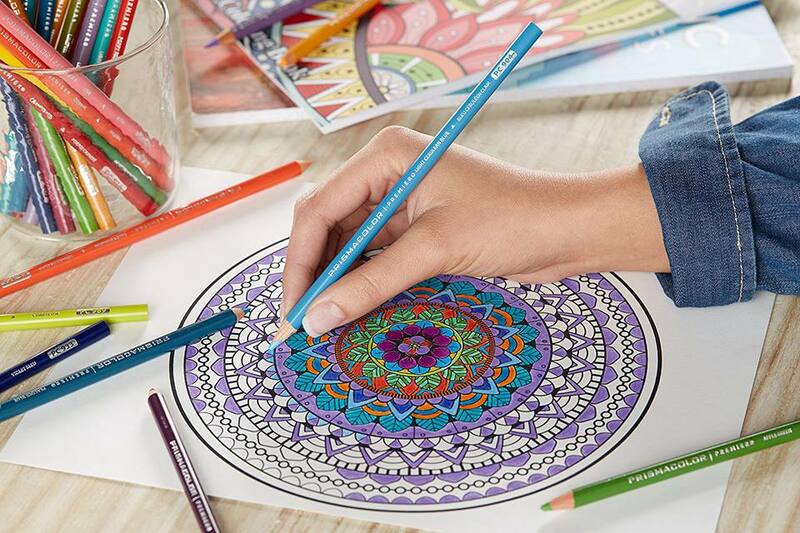 Whether it’s for a detailed school project, an intricate masterpiece, or coloring in that adult coloring book for fun and relaxation, Prismacolor colored pencils are the finest quality colored pencil available and a #1 bestseller. They are a softcore pencil, ideal for shading, layering, and blending. Prismacolor Premier Colored Pencils have a durable, highly-pigmented lead core for reduced breakage and rich colors. This Premier Colored Pencil set comes in 72 vibrant colors, neatly packed into three easy-to-store trays in a metal storage tin. Kids and adults will use this big bin of professional quality gel pens. All crafters need a good set of pens and gel pens offer smooth, roller-ball writing that’s perfect for scrapbooking, drawing, coloring, journaling and so much more. The Smart Color set is acid- and lead-free. This set has it all: glitter pens, milk pens, Neon, and standard pens — in every color you can think of. Hours of inking fun comes in this big tub of gel pens. No crafter should be without them! There are dressmaker’s shears, tailor’s scissors, and pinking shears, but a good pair of all-purpose scissors is the one all-purpose cutting tool your craft closet should never be without. The Westcott 8” Titanium Bonded Scissors has got all of your multi-purpose crafts covered. There’s a reason why this two-pack of scissors is a #1 best seller. The Westcott scissors have titanium bonded blades that are lightweight, stronger than stainless steel and resistant to corrosion. And the ergonomically-designed, soft-grip handle ensures easy cutting and minimal hand fatigue — so important for those big cutting jobs. From paper to fabric, from cardstock to cardboard, the Westcott blades will give you precise cutting with clean lines for nearly any project. Painted rocks, toddler masterpieces, brightly-colored wood crafts —the list of things you can create when you have a set of vibrant Apple Barrel Acrylic Paints in your craft collection is truly endless. This best selling set comes with 18 of the most popular colors, including the good ol’ basics like black, brown and white. The creamy, highly-pigmented formula glides on smooth, ensuring even coverage — no matter the surface. The non-toxic paint dries to a durable matte finish in minutes. And if you’re not using them on traditional paper or canvas surfaces, no worries! Apple Barrel paints are specially formulated for use on styrofoam, plaster, wood, tin, terra cotta, styrofoam, toddlers’ hands and so much more. Cleanup’s a breeze, too: Apple Barrel paints are water soluble, so they clean up quickly with some soap and water. On virtually every crafter’s must-have supply list that we’ve consulted, there was a glue gun. "Why?" you ask. Well, there isn’t much you can’t make with a reliable glue gun. Heck, Pinterest has an entire board dedicated to “Glue Gun Life Hacks.” The CCbetter Mini is one of the highest-rated glue guns we found and it’s a #1 best seller on Amazon. This little helper heats up to a working temperature of 356 to 392 degrees in as little as three to five minutes and can maintain a steady temperature for smooth, ideal adhesive. It can be used on virtually anything you can think of: glass, fabric (yes, those of us that don’t sew have hemmed pants with a glue gun), ceramics, metal, wood, and more. The trigger will propel the glue flow and stop the flow when released for precise application and control. The CCbetter Mini comes with a starter set of 25 glue sticks, each 0.27” in diameter and 10” long. But you may want to consider ordering a refill pack at the time of purchase because this glue gun will quickly become your new best friend. Professional artist, finger painter or face painter — no matter your medium, having a decent set of assorted brushes is a must for any well-stocked craft closet. This basic brush set by Heartybay has an assortment of 10 different brushes perfect for use with acrylic, watercolor, oil, face paint, Gesso, craft paint, and more. Each brush is approximately 6.5” to 7.3” long with a seamless nickel ferrules that won’t split or corrode. And these soft, nylon-hair brushes won’t shed, ensuring frustration-free painting. This set includes brushes from ⅝ for wide strokes to 2/0 for fine detailed work.